The latest feature in the Tamahere Reserve came as a surprise to the man who has spent more time there than most. 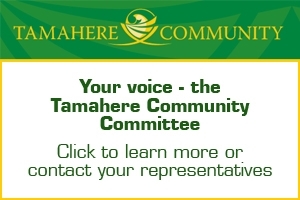 The family of Tamahere-Mangone Restoration Trust chairman Leo Koppens took advantage of his recent absence on a holiday to erect a touching tribute in the reserve to their father and his years of work to return the 4.6ha bush to health. 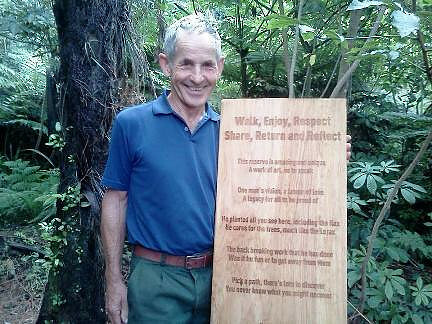 The macrocarpa wood plaque shows the family’s admiration for “one man’s vision” but also urges reserve visitors to “walk, enjoy, respect, share, return and reflect”. The plaque was a birthday gift for Koppens, who turned 70 this month and marked it by exploring a slightly bigger natural environment – the Routeburn track in Fiordland and Mt Aspiring National Parks. 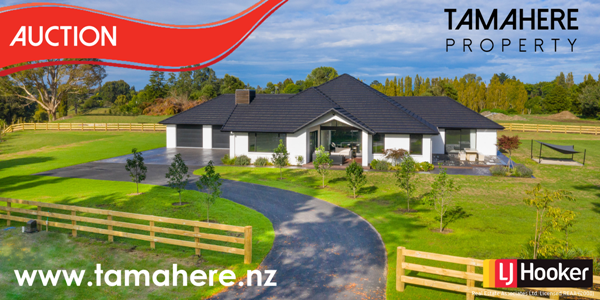 He returned to Tamahere to be shepherded to the Tauwhare Rd reserve for the ‘big reveal’ of the plaque whose lines had been written by his five children, their spouses and grandchildren. They describe the reserve as “amazing and unique and a work of art”, and Koppens’ efforts as “much like the Lorax”, the creature from the Dr Seuss book and film who “speaks for the trees”.